We have a wonderful, old theatre downtown that brings in all sorts of stage shows and concerts, but also regularly shows classic films, particularly at Christmastime. Built in 1927, it is older than even the oldest of the movies shown there. It is an ornate architectural time capsule complete with columns, arches, draperies, and crystal chandeliers that started as a 2,200-seat vaudeville venue. Seating capacity was reduced during renovations near the end of the last century to 1,075, but that is still significantly more seats than any movie theater I frequent. I mention this because I just went to see Frank Capra’s masterpiece It’s A Wonderful Life for the first time on the big screen, an experience that was particularly unique because it was showing in the aforementioned theatre to a packed house. There is a special kind of magic that comes with watching one of the greatest movies ever made in that setting, surrounded by hundreds of other people. I couldn’t tell you how many times I’ve seen It’s A Wonderful Life. A lot. At least once a year for as long as I can remember, and sometimes more than once. But I’ve always seen it with small groups of friends or family, even by myself. But watching it with hundreds of other people made me appreciate aspects of the movie even more than I did before--and this film is on my top three list of greatest movies ever made. But George never goes to Europe, and he never goes to college. He never builds anything bigger than the model bridge in his living room. He gets stuck running the Building and Loan business his father and uncle started, and it seems to George that life is passing him by. Along the way he marries Mary Hatch (Donna Reed) and they gradually fix up a dilapidated old homestead that Mary has been in love with since she was a girl. It is there amongst the leaky rafters that they start their married life, and it is there that they raise their children and face together the struggles of life. Despite his own personal frustrations, George Bailey is a man of honor and deep conviction who spends most of his time and resources and, in fact, his life helping other people achieve their dreams. For years, he sets aside his own aspirations to ensure that others are happy. Year after year, setback after setback, George continues to care more for others than for himself, until one Christmas Eve when his world begins to collapse around him. Uncle Billy (Thomas Mitchell) seems to have somehow misplaced the $8,000 he was depositing in the bank, and the bank examiner is waiting at the Building and Loan to reconcile the deposits before the holiday. The news shatters George’s celebratory preparations for his younger brother’s return home from being recently decorated as a war hero. George quickly spirals down into a very dark place, lashing out at his family, his friends, and even strangers. Desperate, he pleads with Mr. Potter for financial assistance. Potter, played with calculated villainy by Lionel Barrymore, is a hateful, old miser who runs nearly everything in town, except the Building and Loan. When George has nothing to offer for collateral for a loan except for $500 equity in a $15,000 life insurance policy, Potter cruelly suggests that George is worth more dead than alive. Shortly thereafter, George is standing on a bridge over an icy river, staring at the swirling waters through the falling snow. Just then, a loud splash and a cry for help cause him to forget his worries and he jumps in to save a stranger. The stranger, as he comes to find out, is one Clarence Oddbody, Guardian Angel Second Class. Clarence is played with delightful, simplistic charm by Henry Travers in a performance so endearing that it is difficult not to compare all other on-screen angels to him. George disbelieves the strange, little man’s story, and wishes aloud that he had never been born. 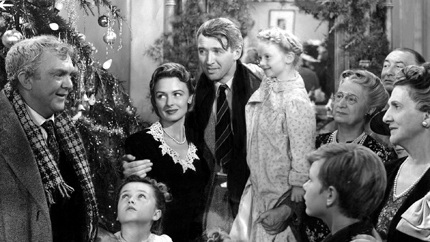 Clarence grants George’s wish and begins to show him how life might have been without George Bailey. Through a series of disturbing and even horrifying revelations, George comes to realize that he truly had a wonderful, blessed life, even with all the hardship and disappointment. Christmas without watching It’s A Wonderful Life would hardly seem like Christmas to me. But now I’m not sure I can be content to just watch it in the solitude of my family room if I have the choice of being surrounded by hundreds of others who are also willing to publicly share this emotional journey. It is hard to feel alone in the world when you sit elbow to elbow with people you previously knew nothing about, and then you discover, together, that you laugh and cry at the same things. That you feel the same dizzying moments of unbridled joy coupled with times of despair and discouragement.